The Camp Fire destroyed the town of Paradise on Nov. 8th, 2018. After more than two weeks, the fires are still burning. This is the transit chart for the moment the NYT reports the fire to be started. The fixed sign Scorpio is rising and its ruler, the malefic out of sect, Mars, is angular on the 4th Quadrant house cusp, squaring the Moon. Mars puts in danger everything associated with the 4th house, land, soil, houses. While Saturn is in a separative aspect to the AC, Mars is in an applicative square. The Sun is conjunct the AC in aversion to both benefics and applying Mars. Scorpio is a fixed sign thus the fire was not to be extinguished quickly. The Moon is in the last degrees of a fixed water sign and soon changing into a fire sign, which contributes to the quickly worsening situation. Sagittarius is a double bodied sign, so while the fire spread around, it was stable (fixed sign rising) in the sense that is could not be forced back. We also find the Moon, still dark, but already in its increasing phase, which also contributed to be an indomitable fire. 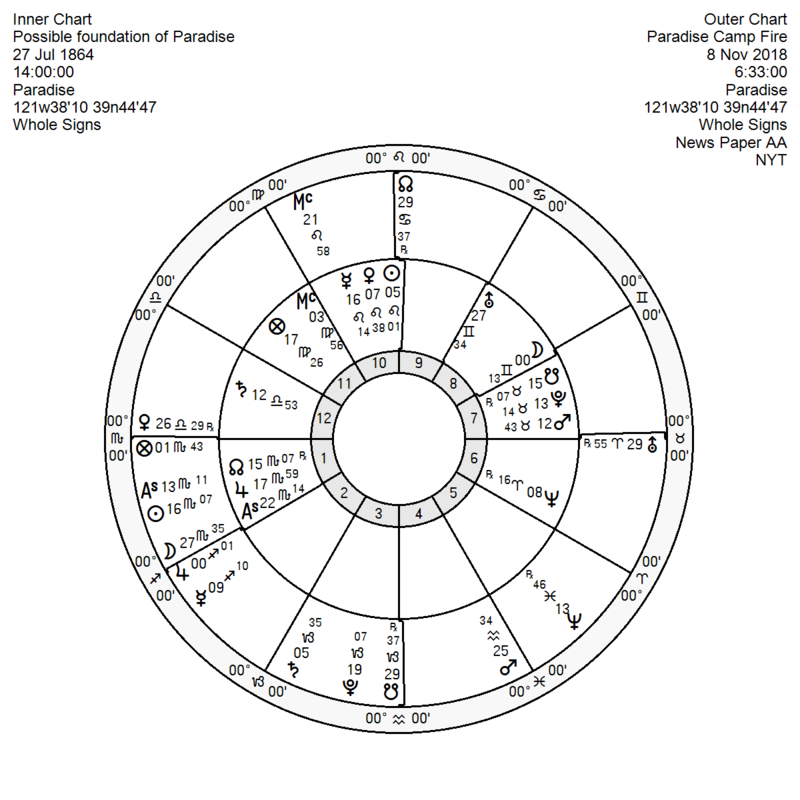 Since the transits alone are never enough to judge such an event, I searched for a foundation chart of Paradise. Agreed, this is pretty dirty data, but I wanted to play with it and see what would come up. I was surprised. When speaking of a place which is called “Paradise” we would certainly assume one of the benefics in an angle, possibly Jupiter, because “paradise” is anything than a modest name. While from the quote above we don’t know the day of the foundation of Paradise, we can still assume it was around July, the heart of the summer. What I am most interested in are the outer planets, thus even if the day is not correct, their positions should be approximately right, supposing the story is true. 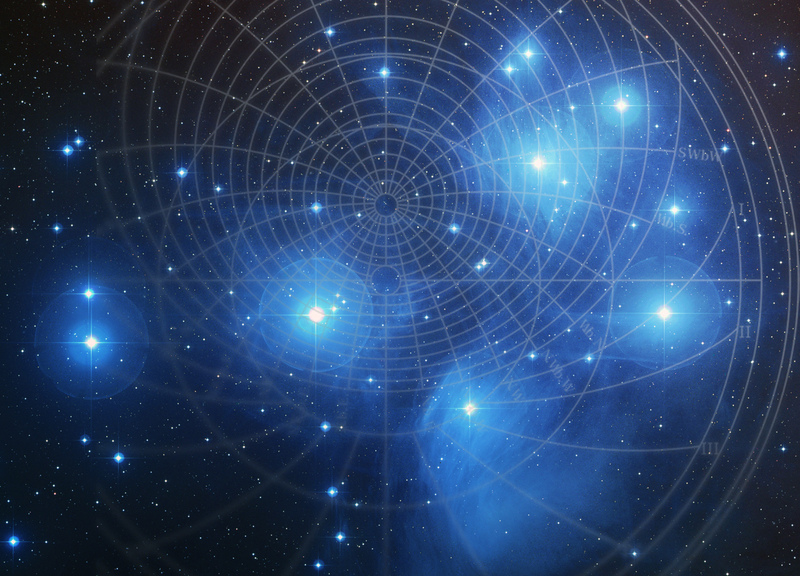 Mars is conjunct Pluto and the South Node. This makes Mars triggering his own house (if the time is correct) from his exile. In other words, Marsian events are likely to harm the physical status of Paradise. The Sun is going to square Mars and sextile Saturn. Jupiter, close to the Ascendant squares Mercury, the ruler of the 8th house and dispositor of Fortune. 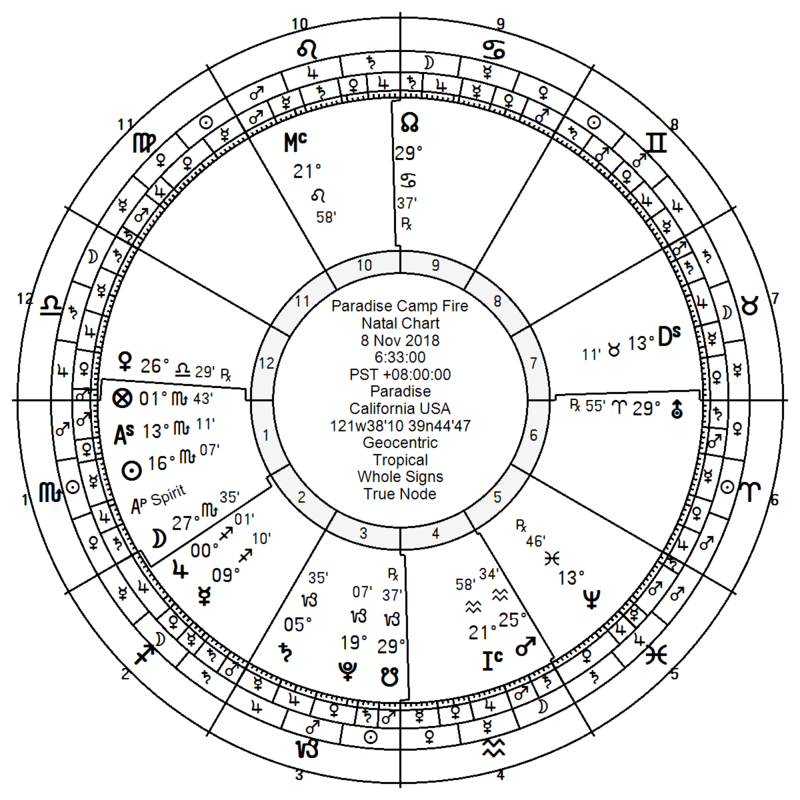 In the be-wheel, we see immediately that the Mars/Pluto/SN conjunction in the foundation chart exactly opposes the Ascendent of the Camp Fire. Any Mars-Pluto event is huge and violent and in this case, it opposes the 1st house, related to the “physical well being” of Paradise. Jupiter has just entered fiery Sagittarius and opposed the Moon in the 8th by a partile aspect. Mercury, the ruler of the 8th house is also in Sagittarius and going to sextile Saturn in the 12th house of hidden dangers in the foundation chart. Mercury is destroyed by Mars. A death by attacks of enemies or bandits, burns, collapsing buildings, blindness, imprisonment, the wrath of nobleman, from captivity, falls from animals or high places, crushing of limbs, animal attacks, Women die from collapsed uterus, abortions, hemorrhages, consumption. Jupiter has just entered the fire sign Sagittarius and opposes the Moon in the 8th house, while the Moon will first join fiery Jupiter (in doing so she will make an opposition to her own position in the foundation chart) and then join the ruler of the 8th and dispositor of Fortune. In 2008 there has been another major wildfire, remembered as the Humbold wildfire. 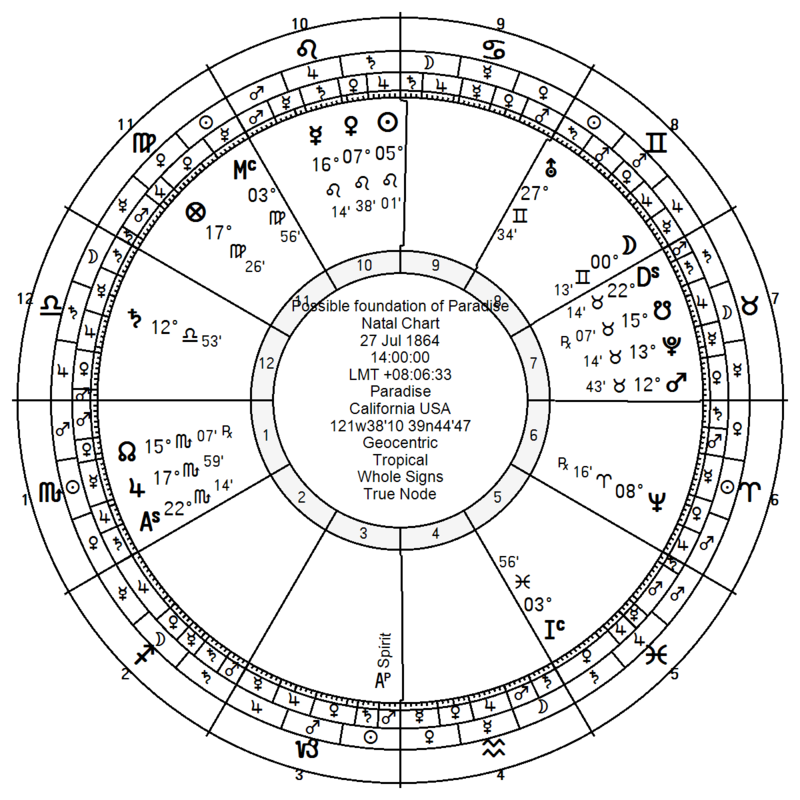 As we can see in this noon chart, both transiting Mars and Saturn are conjunct the MC of the foundation chart and are squared by the Moon in the foundation. The transiting Moon is conjunct Saturn. However, in this chart, Mercury casts a square to the AC while Jupiter bonifies the AC by an exact sextile. The fire is huge, but not a total disaster. 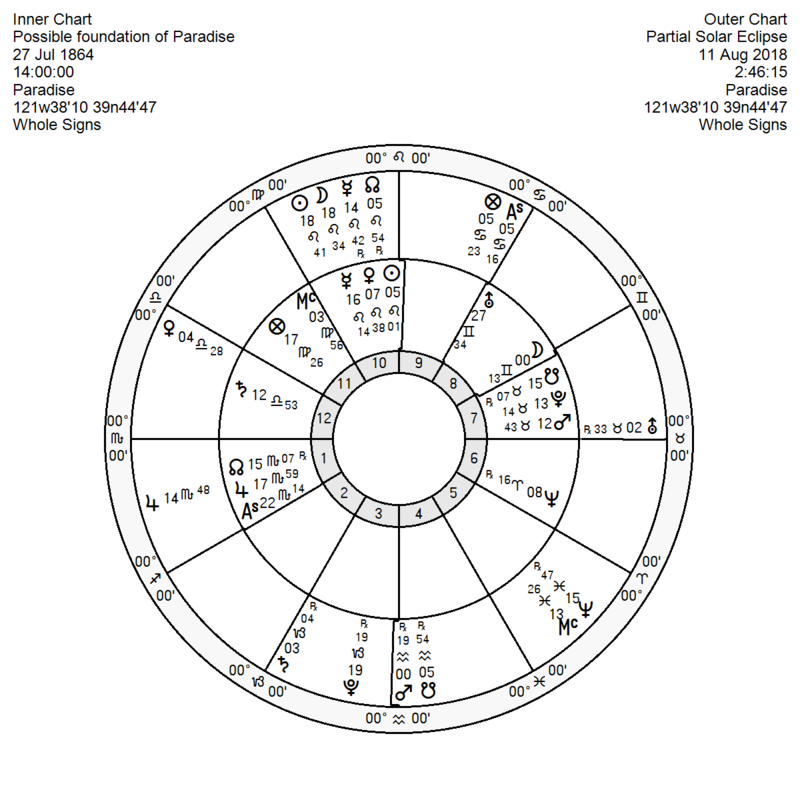 Nevertheless, the chart that really hit me in relation to the hypothetical foundation chart was the eclipse chart, calculated for Paradise. The Sun eclipse occurred in Paradise 10th house, in conjunction with Mercury, the dispositor of Fortune and ruler of the 8th house. And Mars, during the Camp Fire, opposes this conjunction at 25° (not shown in the chart above). At the same time, the eclipse squares Jupiter close to the AC and threatens the life (1st house) of Paradise. Finally I looked at the annual profection. Following the quote above, Paradise is 154 years old and thus in a 1st house progression year, which makes Mars to be the Lord of the Year. As stated above, Mars is also the destroyer of Fortune in Virgo. Mars thus activates the opposition with Jupiter and in the transit chart of the Camp Fire we see, that Jupiter has just entered the fire sign Sagittarius. Transit Mars in the 4th house destroys the land and homes and Jupiter makes it really big and his position in a human sings asks for a high death toll. The date of 1864 seems to be reliable even though the story of the great great grandfather sounds quite fantastic. However, both events, the Humbold and the Camp Fire relate to it and so does, in a very impressive way, the Elipse chart.